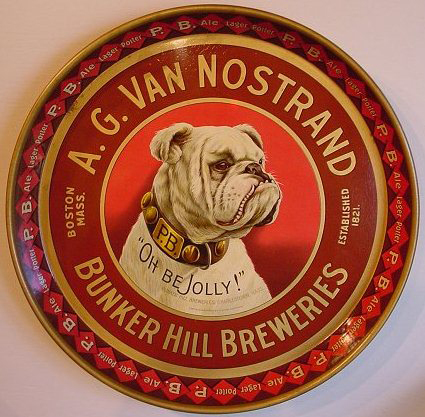 This pre-prohibition tray for A.G. Van Nostrand Bunker Hill Breweries out of Boston, Mass is a 12″ round. The main figure of the tray is a bulldog wearing a collar with “P.B.” (most believe this stands for Purest and Best) and the tagline “Oh Be Jolly!”. This tray is a real beauty and is prized by collectors. Value is very dependent on condition so Contact Us for more information.